Heat gas or charcoal grill. Cut 18x12-inch sheet of heavy-duty foil. 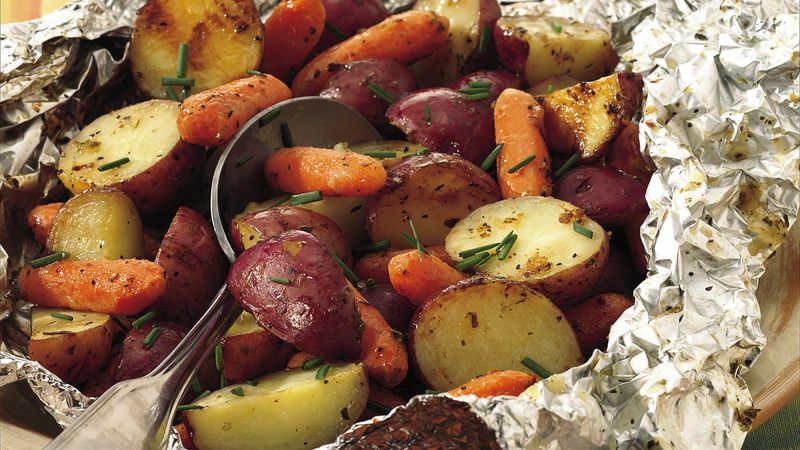 Place potatoes and carrots on center of foil sheet. Drizzle with butter. Sprinkle with Italian seasoning, peppered seasoned salt and cheese; stir slightly to mix and coat vegetables. Bring up 2 sides of foil so edges meet. Seal edges, making tight 1/2-inch fold; fold again, allowing space for heat circulation and expansion. Open packet carefully to allow steam to escape. Sprinkle with chives. You can use russet or Yukon Gold potatoes in place of the small red potatoes; simply cut the larger potatoes into uniform, bite-sized pieces. To make this dish even hardier, add sliced or cubed cooked chicken to the packets before grilling. Foil bags and pre-cut foil sheets are available in grocery and discount stores to make this recipe even easier to prepare. You can make packets up to an hour or so ahead of time. Place on a large baking sheet in the refrigerator until ready to grill, grilling as directed.